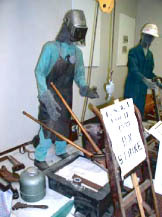 The focus of this exhibit is on black labor. We have targeted key historical, social and economic events that affected and influenced African Americans as a workforce. It is our hope that you will learn a great deal about the presence and contributions of African Americans particularly in Wisconsin. There are sections on how slavery, agriculture and migrations forced Black workers into certain types of jobs. Beginning in the early 1900’s, industrial expansion and wars soon lead to the shift from fields to factories. See the world unfold before your eyes, from ancient Egyptian civilization to early African American settlers in rural Wisconsin. A larger than life panorama of African American history provides a glimpse of modern life of African Americans in Milwaukee. This mural was conceived by Mr. Benson and artfully executed by artist George Gist. This exhibit tells of the hard work, the labors of our forefathers and mothers. So, we ask the greatest of our greatest grandmothers and the greatest of our greatest grandfathers, and all ancestors who have, gone before us, for help in telling this story about the “work”, we have done. We must see ourselves through our own eyes and reflect the true nature that is our heritage. Our legacy to future generations is at stake. It was the pursuit of a better life by means of greater working opportunities that brought thousands of African Americans out of the south and east to the north and west at critical periods in this country’s history. Despite the limitations often placed upon them, African Americans were pioneers, leaders and great contributors to the growth of this nation and to the settlement of Wisconsin. These were men and women who made enormous impacts, striving for freedom and toward making their marks as laborers, entrepreneurs, business owners and leaders of our community. This replica of the NAACP Civil Rights Tribute Bus depict those local and national civil rights pioneers. Some of these pioneers include Lloyd Barbee, Father Groppi, Vel Phillips and more. Visit the museum for more on this exhibit.